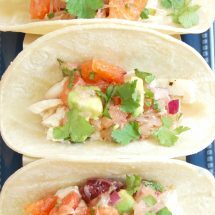 Fish Tacos with Citrus Salsa are a quick and easy, flavor-packed dinner the whole family will enjoy. Happy Tuesday! Do you know what today is? Well, it’s the 21st of the month, which means it’s Recipe ReDux reveal day and since this month the 21st is a Tuesday, this month’s theme is Taco Tuesday! I couldn’t be more excited! We love tacos in my house. It is by far one of my girls’ favorite meals and one I never have to worry they will eat. While I have previously shared my steak tacos and chipotle beef tacos, fish tacos are actually my go-to for taco night. Early on in this blog’s existence, I shared my recipe for fish tacos, but over the years I’ve made so many variations of that original recipe and the pictures from the original are so bad that it was time to share a new and improved fish taco recipe (if you’re really curious about the original, you can search for it – I’m too embarrassed to post a link!). These Fish Tacos with Citrus Salsa are the perfect tacos for the winter months when it’s pretty much all citrus all the time in our house. The basics of the recipe are so simple that you can change it up by season: in the spring serve these fish tacos with my spicy cherry chutney and in the summer serve them with watermelon salsa, corn & black bean salsa, or the nectarine salsa featured in the steak tacos mentioned above. So many delicious combinations, right?! But let’s get back to this one. While most fish tacos you find in restaurants are breaded and fried, I always bake or grill the fish for tacos at home (and when out I ask for the same). The fish for these tacos is very simply prepared. I use tilapia fillets because they’re economical, easy to find at pretty much any fish counter, and very mild tasting, which is perfect for letting the flavors of the citrus salsa shine through. To make the fish, I brush both sides with olive oil, drizzle with lime juice, and season with a little Kosher salt and freshly ground pepper. That’s it! Bake it in the oven for 15 to 20 minutes while you’re making the salsa and your protein is done. Really can’t get easier. To make the citrus salsa, you can use any combination of citrus fruits you prefer. For this recipe I used pink grapefruit, Cara Cara oranges, and blood oranges. However, if all you have on hand are traditional naval oranges, then just make it with that and if you have ruby red grapefruit add some too. I highly recommend separating the grapefruit segments over a bowl to catch the extra juice, some of which will be used in the salsa and the remainder of which can be used for salad dressing (like this Citrus Yogurt Vinaigrette), marinades, and sauces. Once you have your grapefruit and orange segments, cut them or break them into smaller bite-sized pieces and combine them in a bowl with jicama, avocado, jalapeño, cilantro, some of the reserved citrus juices, lime juice, and salt. You don’t need to worry about the avocados browning in this salsa thanks to all the acidity from the citrus, but I do recommend not letting the salsa sit for longer than 30 minutes before eating, otherwise it may be mushy since there’s so much juice in these fruits. To serve the tacos, warm up whole-grain corn tortillas and top them with the flaked tilapia and a couple of tablespoons of citrus salsa. Garnish with extra cilantro and enjoy! Fish tacos are quick and easy to make and nutritious and delicious to eat, making for a winning dinner in my house. Top with this bright and refreshing citrus salsa during the winter months, and when the seasons change use different seasonal fruit like watermelon, nectarines, and cherries. Serve on whole-grain corn tortillas for a gluten-free, dairy-free meal the whole family will enjoy! Preheat oven to 350 degrees. Place tilapia in a baking dish, brush both sides of fillets with oil, drizzle with lime juice, and season with salt and pepper. Cook fish for 15 to 20 minutes until cooked through (cooking time will vary based on thickness of fish). Remove fish from the oven and use a fork to break fillets into smaller pieces. 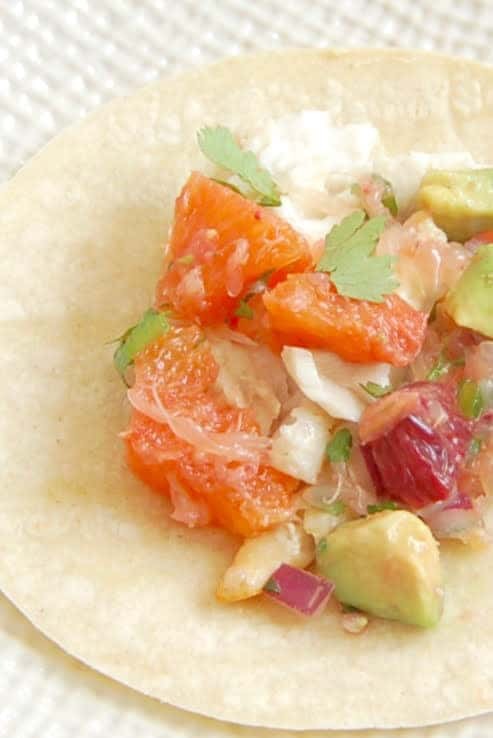 While fish is cooking, prepare the citrus salsa. Remove the peel and white pith of the grapefruit. Cut the grapefruit segments over a bowl to catch any of the juice. Discard the membranes and cut or break grapefruit segments into smaller pieces. Remove the peel and white pith of all the oranges. Cut orange segments into smaller pieces (remove membranes if preferred). In a medium bowl, combine grapefruit and orange pieces, jicama, avocado, red onion, jalapeño, cilantro, 2 teaspoons of reserved citrus juices, and lime juice. Season with salt and toss to combine. Wrap corn tortillas in damp paper towel and microwave 30 seconds to warm, or wrap in foil and warm in oven for a few minutes. 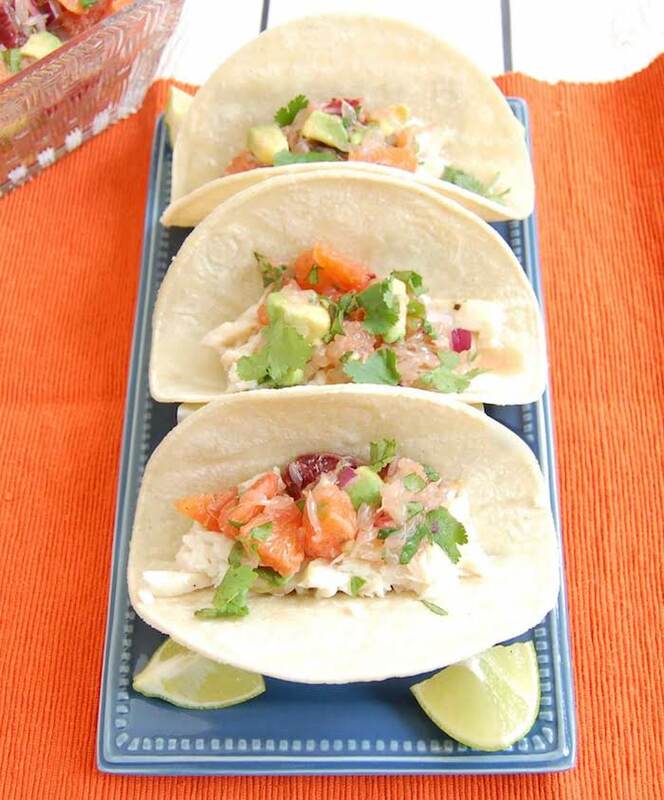 Top tortillas with flaked fish, a couple tablespoons citrus salsa, and chopped cilantro, if using. What’s your favorite taco pairing? I’ve never made (or ordered fish tacos) which is crazy because fish is probably my favorite protein so this is great inspiration- pinning! Are you serious? That’s pretty crazy, lol! Can’t wait for you to try them! Perfect timing! Can’t wait to hear what you think of the recipe! That citrus salsa sounds SO good (cara cara oranges are the best)! I haven’t made fish tacos in far too long and it’s definitely time to change that. I love cara cara oranges too! Can’t wait for you to try them! THIS girl loves herself some fish and would loveeee to wrap this filling up in some Paleo Wraps! and I can’t wait for you to do so! This looks so fresh and delicious, Jessica! I loved The Redux theme this month. Gotta love tacos!! Thanks Jodi! I also loved the theme – I never get tired of tacos! Citrus salsa?!?! I’ll take a whole bowlful, please! Smart move – it’s so good! Even just with chips! I love this ismple and easy recipe. It’s something I can make as an easy dinner! Thanks! Simple dinners are the best! 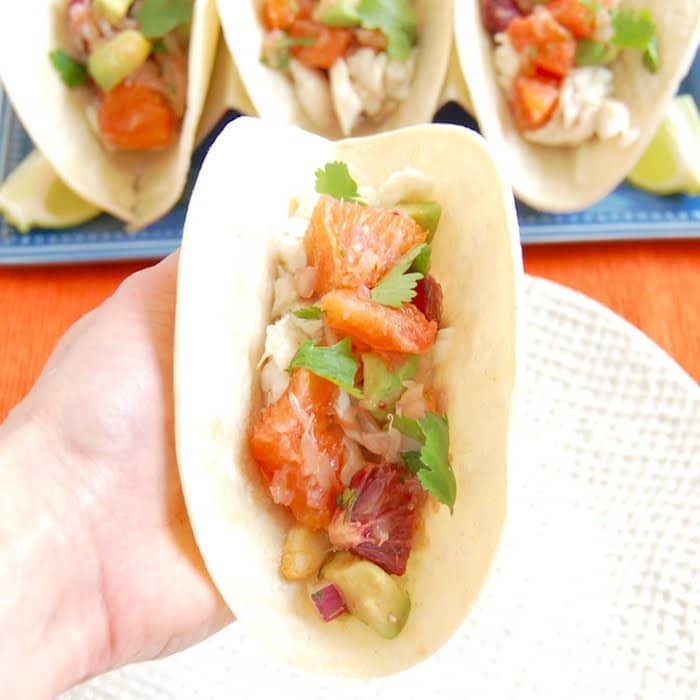 Love a good fish taco and the citrus salsa sounds amazing and would pair perfectly with them. I’ll have to give it a try the next time I make them. Thanks Sarah! Can’t wait to hear how you like them! We have been crushing big time on Cara Cara oranges lately. They are soooo good!! This citrus salsa sounds so refreshing and delicious. So have I! I can’t get enough of them. This citrus salsa would be great on tofu too for a vegetarian/vegan meal! I can’t get enough citrus this winter! Love that you made tacos out of it! It’s so good and a great way to keep colds and flu away! Thanks Laura! Love fish tacos, they are my favorite! These look delish! Thanks Danielle, mine too! Hope you give these a try! I love all of the freshness in your taco! The citrus and avocado are gorgeous! Thanks Lindsey! It’s a very vacation-like flavor combo! Yes! Adding citrus to tacos is like the best ever! Did this to my taco bowl last week and was the best decision. YUMM. I agree! I should try a taco bowl soon – sounds yummy! These look great! For some reason, tilapia has actually gotten harder to find in my local area. 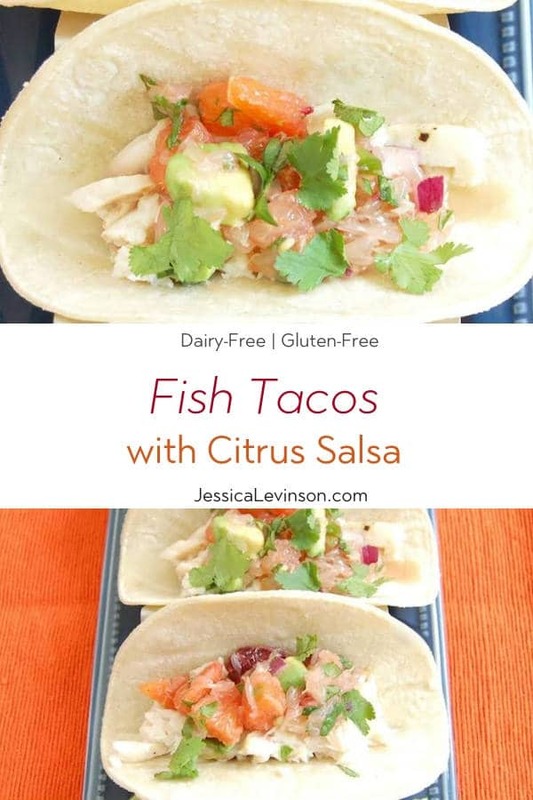 What other fish do you recommend for tacos like these Jessica? Thanks Alisa. Sorry to hear that about tilapia. Cod, halibut, and bass would also work really well. I want to put that citrus salsa on everything!!!! You can’t go wrong doing that!! Wonderful! I love citrus salsa! Thanks Abbie. It’s really delicious! Jessica, this is right up my alley! These look so fresh, bright and flavorful with that perfect burst of citrus! Thanks so much sonali! I think you’ll love them! That citrus salsa sounds amazing! These are a definite must make for my next Taco Tuesday dinner! Thanks Taylor! Can’t wait for you to try them! I’ve been dreaming of this citrus salsa, and I have all the ingredients already! Can’t wait to try these for my family! yay! Can’t wait for you to make it and to hear how you all liked it! Thanks Anne! We just got back from an island-vacation actually and had so much fish and ceviche and this really reminds me of what we ate. Was so good! I’ve never had a citrus salsa before – what a great idea! Looks delicious!! I hope you try it Whitney – it is quite refreshing and delish! Thank you! I love love love fish tacos.. especially with a fresh mango salsa. I’ve never thought to swap out with some citrus. Looks fab! Oh, I am sure you will enjoy these Kara! And I sure hope you do give the citrus a try! These look so yummy Jessica! I make a Cara Cara Orange Salsa too, but it’s been awhile since I’ve made it. Tacos are definitely a family favorite at our house too! Thanks so much EA! Oh, I’ll have to check out your Cara Cara salsa! And let me know if you and your taco-loving family give this a try! These look samazing. My husband is wild about fish tacos. He’s going to love these! Thanks Mona! They’re so delish – hope your hubby likes them! These look super yummy! I’d have to make it without the grapefruit. Think it would still be good with mandarins to keep the citrus in there? Thanks Rachel. Definitely delicious even without the grapefruit. I use whatever citrus I have around when I make it. Hope you give it a try! Ooh love everything about this taco! Looks so fresh and perfect. That citrus salsa looks addictive! Thanks so much Abbey! Hope you enjoy! Oh wow! What a refreshing idea for fish tacos! Love it! It’s like summer in a wrap! Thanks so much Mikki. Citrus is actually the best in the winter, so it’s perfect for this time of year. Not your typical winter dish! these tacos look delicious! I LOVE anything with citrus. Thanks Rebecca. Hope you give them a try. These look so fresh and flavorful! I love tacos any time of the week! Thanks Emily. Let me know if you give them a try! I don’t think I ever would have thought to put citrus fruits in my fish tacos. Grapefruits are my favorite though. I’m going to have to give this a try! I hope you’ll give it a try then! They are really delish! Thanks Laura. I hope you love them. Please let me know if you make them! I’ve never tried making my own fish tacos but I love em’! :D!! These look delicious and I love that you made em’ citrus-y! They are so easy – you have to make them!!! This looks so fresh and delicious! 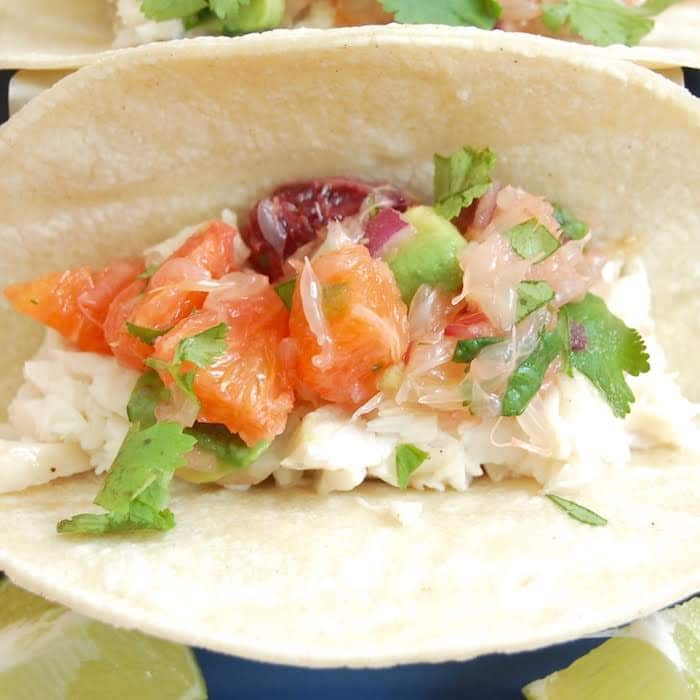 I love fish tacos with a mango salsa…never had it with grapefruit but now I want to try! Mango salsa is quite popular with fish tacos. Hope you give my grapefruit version a try!